Synopsis: Build The Perfect Bug Out Bag shows you how to create your own 72 hour survival bag. Most of all everything you need to gather for your BOB and many more considerations to take into account. Rating: 4/5 – A must read for anyone wanting to prepare a Bug Out Bag properly. 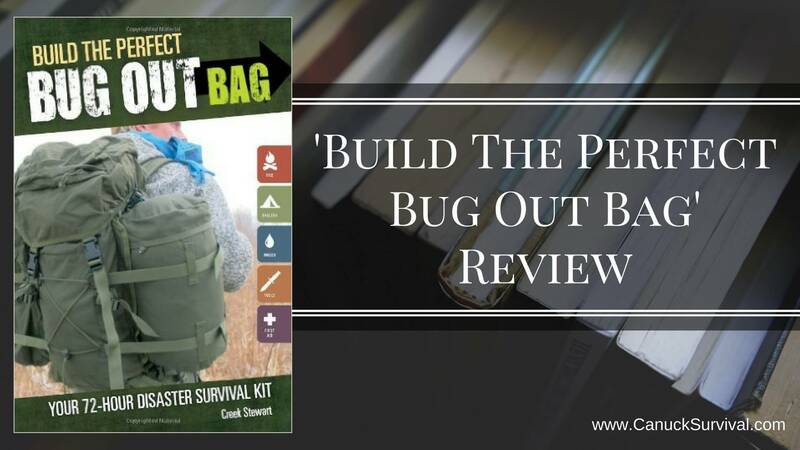 Build The Perfect Bug Out Bag is written by Creek Stewart, owner of Willow Haven Outdoor, a leading survival and preparedness training facility in Indiana, APOCABOX, Whiskey Knives, host of The Weather Channel’s Fat Guys in the Woods series, and his parents run the Not If But When Survival Store. When it comes to survival, this man lives and breathes it. Due to his training through Willow Haven Outdoors he covers the topic of building your Bug Out Bag specifically,with countless students, backpacking across the world personally, and years of training he wrote this book confident of his abilities in making the perfect bug out bag. I wrote a guide on how to make the perfect bug out bag before reading Creek’s book, after spending the day reading through the 208 pages I went back to revise some of the information, but for the most part through my research and various sources, I was pretty damn close to what Creek suggests in the book, so I’m happy about that. Who is Build The Perfect Bug Out Bag For? First off I want to say, I loved it! It was easy to read and offered a lot of advice with some great tips on things I wound’t have thought of. One example is putting a small rock in the corner of an emergency blanket and tieing a rope around it, this creates a tie-down in a blanket without grommets. This book is designed with the beginner preppers in mind, however Creek offers three categories of BOB items depending on your survivalist skill levels. P3 – The “I don’t know anything and rely only on my gear” type person. Most readers I believe will fit into the P2 category, but it’s okay if you’re a P3, at least you’re getting started. The P1 people more than likely already have figured out the perfect BOB for themselves over the years and may not find this as useful as the rest of us, and that’s okay too. After the intro it gets right into the business of choosing your BOB pack. The style, size, key features to look for, and more are covered in this chapter. After the backpack there are twelve more categories that range from Water & Hydration (pg. 28) to Protection & Self-Defense (pg. 128). Each category covers what is necessary, why it’s needed, and how to use it. The information provided in Build The Perfect Bug Out Bag is impressive. From the quick tips, to multi-use items, and of course the deep explanations and uses for each suggested piece of gear. Furthermore, Build The Perfect Bug Out Bag is well written and easy to understand. This makes the book beginner friendly, which is great to see. I also liked how Creek included a chapter on BOB maintenance. This is something on the back of my mind but I wasn’t really sure the proper way to go doing it. Creek covers how he does it and suggests why you should adopt the same or similar habits. Creek even provides a link in the book to a downloadable checklist for you to use. In addition to all the good stuff, I couldn’t help but notice some things I find odd. An example is image and caption placements not coinciding with the info on the page. Page 92 is about mirrors and emergency survival blankets, however it includes pictures of rubber gloves, tweezers and safety pins, and insect repellent. These are mentioned on the previous page. Page 94 then has a picture of a different type of signal mirror and emergency blanket. Seems a little redundant to me. Maybe it makes sense from a design point of view to use photos to fill space, but I feel it takes away from the flow. Overall, Build The Perfect Bug Out Bag is an excellent book and I’m happy to add it to my library. It definitely will come in handy again and again as a review piece or even to share with family and friends so they too can get in the mindset of preparation and survival. Check the current price on Amazon now. Have you had a chance to read Build the Perfect Bug Out Bag? Have a favourite of your own you’d like to share? Leave a comment below! Great information! Just what I was looking for. Thank you very much! I’m glad this article could be of help! Hi,I check your new stuff named “Build The Perfect Bug Out Bag Review – Canuck Survival” regularly.Your humoristic style is witty, keep doing what you’re doing! Thank you very much! I’ll try and keep up the good work!